Typically, a zinc die casting die is quite expensive. And, many times the only difference from one die to another is some cavity feature. Many zinc castings are similar except for styling. Others can be grouped into categories of similar sizes even though the castings are otherwise quite unrelated. The designer can often achieve considerable tool construction economy by fitting the die into a standard die set or unit die. Complete die assembly can be purchased. These are available commercially. Many dies can use these standardizations as basic building blocks for die. Increase in standardization there is usually a reduction in the original cost of the die and a reduction in construction lead time. But, there are trade offs. As tooling standardization becomes more rigid, die set-up, casting yield, and production efficiency may be sacrificed. Naturally, when there are no advantages, the highest level of standardization should be used. When there are trade offs, each option should be analyzed for its total cost effectiveness. These items are pre-machined to catalogued sizes. These sets contain all the necessary blocks, plates and rails plus sprue bushing, sprue spreader, leader pins, ejector plate guide pins, and ejector plate return pins. These items are evenly bolted together. The die builder must install the cavity blocks, ejector pins, and water cooling. Unit dies provide for relatively quick changing of cavity block in the bolster or die block. You pay for the inserts and not the whole Tool. Lower cost tooling – you only pay for the insert, cavity detail and ejector plate. Quick tooling lead times – no unnecessary cost for tooling bolster design and build. Lower product cost – only a few minutes production set-up cost, ideal for small batches. 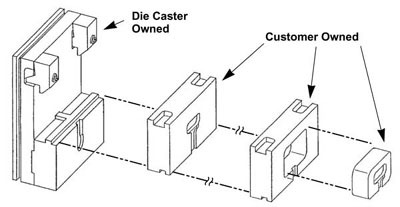 Diecasting Size – Some die castings are too large in some or all of their dimensions to fit into a unit insert. Ownership – Although our customers own the unit insert it is not a full tool and cannot be run without a bolster.